Meadow Mixture - MM07 - Dry Acid Soil is designed for the (low rainfall) dry East Coast of Ireland and parts of the North East and South-East Coast where there is less rain fall and where the soil is usually without Lime (ph neutral to acid) and stony. This is a seed mixture that can be sown with grass seed. Use only 1.5 grams per metre. This mixture may seem limited as some of the most popular species such as the annual Poppy and Field Scabious are not included, However, if you can establish this meadow, it will be very colourful. MM07 is ideal for sites with a slope, usually these soils contain broken flat stones mixed throughout and often lying just below the surface of the soil. The yellow shrub Gorse (furze) tends to grow well in such areas, as does Bracken, Both weeds must be controlled until the meadow establishes. Annuls include: Corn Marigold, Corncockle, Scented Mayweed, Red Bartsia. Cowslip in small quantities has been added, but would not be typical found on Acid dry earth. MMO7 requires cutting every year and most of all 'raking up' or 'gap creating' to keep the weeds from invading it. Often such site were once suited to fire management instead of cutting. 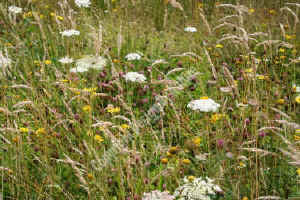 However managing a meadow by fire is dangerous, especially as more than the meadow may burn, therefore not recommended. Instead if the site allows, after cutting and when the bulk of material is removed this mixture can be 'burnt over' with a flame gun in suitable patches as many of the species respond well to starting afresh on new clean ground. 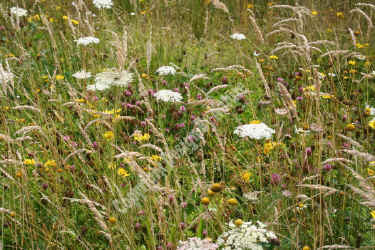 Where there are wet pockets on site sow a more suitable mixture to add further interest to the meadow. The biennial sky blue Sheep's Bit and a mixture of Heathers are often included although difficult to grow, if the conditions are suited to these species, (after burn) they make a lovely addition to this mixture. MM07 will easy on flat or gently sloping ground. 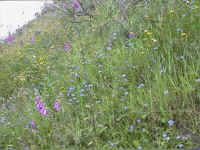 Steep Sloping Ground: MM07 is a difficult meadow to establish and maintain on a steep sloping site, as it often cannot be cut. Customers have often contacted me, after using heavy machinery to clear Bracken, Gorse or shrubs from such steep sloping sites. As they wish to create a low cut no maintenance meadow. Steep slopes are difficult to maintain. I often advise that trees or shrub with a suitable woodland wildflower mixture may be a better choice 9an accept some bracken, as some sites are too steep to safely cut and will if uncut revert to the original flora that grew on the site in the first instance. Good design and management is the secret to success when using MM07 on steep sites. Preparing a steep sloping site is also a difficult task, seek advice. Moisture Level: For dry or very dry well drained soil. Flowering Period: Main flowering May to July, occasionally through August. Fertility Range: Will grow on any infertile soil. Soil Preparation: 'Stone pick' the site. Try not to cultivate the soil in such a way that it brings up the hidden layers of stone. It would be better to kill or the surface vegetation and not plough or rotavate, Shallow cultivate instead. Burning the surface vegetation away, can reduce the need to cultivate entirely. Creating a firm 'fine tilt' finished seedbed may also be difficult. Optimum Sowing Time: Early Spring before the soil dries out, early autumn, when the soil is warm and rain is due. Sowing should take place immediately after burning. Fertiliser: Yes, a low dose can be used, depends on how poor the soil is. High sowing rate 'without added grass seed': 3 grams per metre. With grass, sow an extra 1.5 to 3 grams of Design By Nature grasses. Nurse Crop: As annuals will find it difficult on these soils, a nurse crop may well be required, depending on the density of weeds that were present and what is expected to grow back..
Sowing rate with grasses: 3 to 6 grams per metre depending on the percentage of flora and grass. The annuals supplied in this mixture will flower if the site has some fertility, provided they are sown before June. This mixture requires one cut when finished flowering in its first summer.. In the second year the biennials will also be very colourful. General Cutting Time: Mid to end of Summer and again in spring. Specific Cutting Time: Wait 3 weeks until after the last flush of flowers fade away, after seeds set. Management: Control grasses and weeds until well established. Accept any normal non-invasive weeds as they provide cover, once the sward is established, digging, spot spraying or weed wiping can be used to eliminate problem species. Control weeds, especially Gorse and bracken until established.